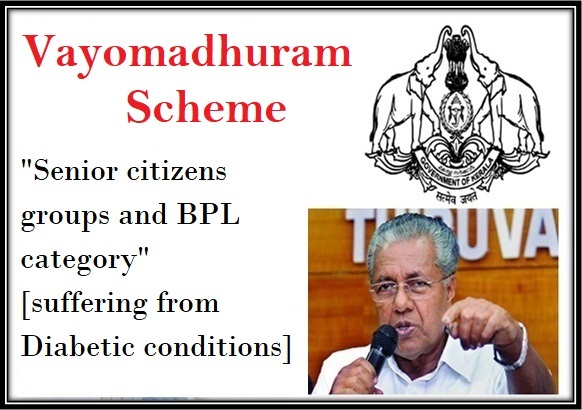 As per the latest updates from the Social Justice Department of Kerala state, it has announced to recently launch the New scheme termed as Vayomadhuram Scheme. The new scheme is designed to offer with benefit to the Diabetic patients within the state of Kerala. As per the government regulations, the patients suffering from Diabetic conditions will be able to request for monitoring their blood glucose levels. One of the major advantages of the new scheme is that it has been launched for the diabetic patients within the state of Kerala. Using the new facility the patients can get their blood sugar level monitored. Free monitoring kits: As a part of the new drive the state government has also announced that it shall be offering each of the beneficiary with the facility of Free monitoring kits. The government has mentioned that within each kit it shall be offering with over 25 testing strips for the patients along with 1 set of Glucometer. Under the new scheme the state government has also mentioned that it shall be offering the kit for much lower price range (starting between Rs 450 to over Rs 2500) for free to the selected groups of beneficiaries. The provision can be used by any patient who is eligible under the scheme and belongs to the targeted group of the society. As a part of the drive the state government also aims at offering with assistance and help to the deserving patients such that the risk of the diabetic condition can be overcome. The patients can perform a self test making use of the provided kit by the state government at their homes itself. The state government has also ensured that it shall be approaching the KMSCL with an aim to procuring the testing kits for the beneficiaries on time after the launch. Implementation Date: At the time of launch of the new scheme on 18th July 2018 the state government will also try and provide the kit to selected 10 people from the selected category of the society. Later on in the initial implementation stage the kits will be provided to over 800 beneficiaries within the state. Local Resident: As per the state government one of the basic rules for eligibility under the scheme is that the beneficiary has to be a local resident of the Kerala state by birth. He or she should have his domicile belonging to the state by birth. Age Criteria: The scheme is only available for senior citizens of the state so it is important that the applicants should be minimum of 65 or above years of age at the time of registration under the scheme. BPL Group: The government has also mentioned that the benefit of the scheme can only be made available for candidates who belong to the BPL (Below Income Groups) of the state. First Preference :The scheme in the initial stage will be offered with coverage to people belong to the Old age homes and other health care centers. The assistance will only be offered to the applicant who is suffering from diabetic condition. Domicile certificate – The applicant will have to provide with a copy of the domicile certification issued by the local authorities mentioning his or her residence ship within the state of Kerala by birth. Birth certificate – To prove his or her residence ship in the state the applicant is also expected to provide with a copy of the birth certificate issued by the health care centers or other municipal bodies. He can also submit a copy of the Aadhar card and other documents describing his status in the state. Caste certificate – As the scheme is only open for the people belonging to the BPL category of the society so it is obvious that the applicant should have to submit a copy of his or her caste certificate issued by the local authorities mentioning his caste and group in the society. Health certificate – The new scheme is only open for people of the state who are suffering from diabetes so it s obvious that at the time of registration the candidates will have to provide with a copy of their health certificate mentioning the health status (if they are suffering from diabetes). The health certificate has to be issued by the local government authorities and health centers. Senior citizens card- In order to prove their age that the applicant belongs to the senior citizens category the applicant will have to submit a copy of the age proof or birth certificate or school leaving certificate. In order to avail the online application form the applicant mush get logged on to the official social justice department web portal services and then request for the PDF format of the online application form print out. Once the form has been downloaded then the applicant can make the submission of the form via physical means along with documents. In order to make the application process online the applicant is expected to download the online application form and then fill it up manually. The application form can be availed at the Social Justice department office or its online web portal services. The applicants are also expected to fill in the form manually and make the submission to the department along with all valid documents. The documents will be verified by the authorities and then the assistance will be provided by the department. With the launch of the above mentioned scheme it is obvious that the state government of Kerala state aims at regulating the number of people who belong to the BPL groups and are suffering from Diabetic conditions. The new move will help them get full assistance of checking with the condition of blood sugar level well in advance and reduced the risk factor.